our kids’ emotional well-being. Michele Borba, EdD, author of No More Misbehavin’: 38 Difficult Behaviors and How to Stop Them, explains. Studies show that between 8 and 10 percent of American children are seriously troubled by anxiety. And all of this was true even before the war and threat of biochemical attacks became the subject of playground discussions. Anxious kids are two to four times more likely to develop depression, and as teens they are much more likely to become involved with substance abuse. Stress symptoms are showing up in kids as young as three years. The good news is that kids’ anxieties can be reduced if we provide them with healthy ways to handle their fears. Studies have shown that about 90 percent of all anxious children can be greatly helped by learning coping skills. And there are simple anxiety-reducing strategies parents can teach their kids. So here is a behavior makeover plan you can use to help reduce your kids’ anxiety in these uncertain times. Start by observing your child closely and watch to see how he is coping. For instance: is he afraid to be left alone or of being in dark or closed places, having difficulty concentrating or excessively irritable, reacting fearfully of any sudden noses, reverting to behavior patterns previously outgrown, acting out or having tantrums, having nightmares, bedwetting, withdrawing, crying excessively, or a experiencing a change in eating or sleeping habits? Each child copes differently, so tune into your child’s behavior. Doing so will help you know how your child deals with life’s pressures. The next step is to determine what is causing the pressure. Listen carefully to your child’s concerns and complaints. Tune into what might be causing fears to escalate. Could she be watching too much distressing television coverage? Is her daily schedule too harried? Is she enrolled in activities that are stretching her beyond her capabilities? Cutting just one thing in your child’s weekly activity may make a tremendous difference in reducing her anxiety. It could be an activity that you want but may not be a top priority for her. Is there just one thing you can eliminate from her schedule? What about yours? Some stressors are just beyond your control. For instance, as much as you’d like, you can’t control the world news. But you can control the amount of TV coverage your child is watching. Pay closer attention to your child’s stressors, then limit (or just turn off), what your child is watching. Monitor also your conversation with your spouse so your child doesn’t overhear your concerns. Also, don’t assume because your child is older, the news does not affect him. A Sesame Street study found that preadolescents admitted TV news bulletins that interrupt their programming were especially disturbed. And they were even more anxious if a parent wasn’t there to help explain the event to them. Tell your child to close his eyes, slowly breathe out three times, then imagine he’s in an elevator on the top of a very tall building. He presses the button for the first floor and watches the buttons for each level slowly light up as the elevator goes down. As the elevator descends, his stress fades away. 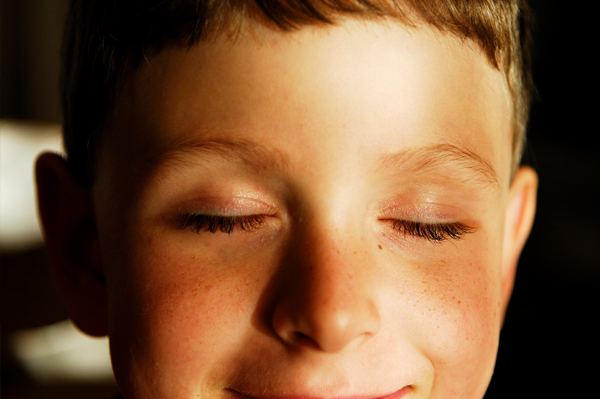 Ask your kid to find the spot in his body where he feels the most tension; perhaps his neck, shoulder muscles, or jaw. He then closes his eyes, concentrates on the spot, tensing it up for three or four seconds, and then lets it go. While doing so, tell him to imagine the stress slowly melting away. Ask your kid to think of an actual place he’s been where he feels peaceful. For instance: the beach, his bed, Grandpa’s backyard, a tree house. When anxiety kicks in, tell him to close his eyes, imagine that spot, while breathing slowly. In times of stress, your child needs to feel embraced by her family. That’s why it’s a good idea to spend plenty of time doing things together — it helps her feel safe and sends a “we’re all in this together” message. Find tension-releasing activities the entire family can do. For instance, go for walks or bike rides, pray or meditate, listen to soothing music or watch humorous videos. It will also help your child learn ways to keep herself strong. Above all, take time to be with your child — especially in these uncertain times. Reassure him by being there for him. These are tough times for everyone, but especially for our kids. If your child shows signs of anxiety for more than a few weeks or if you’re concerned seek professional help.